Filet mignon, a salmon steak and a perfectly roasted chicken often get all the attention. It’s time to share the stoplight with these supporting side dishes that will make your guests ask for more. These recipes feature a perfect party appetizer, side dish and a ramekin dessert that guests can serve up individually and talk about long after the party is over. 1. 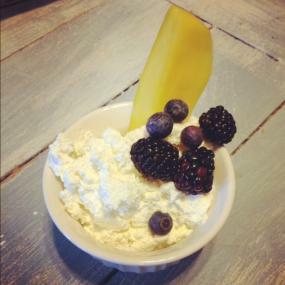 In an electric mixer, whip together heavy cream and goat cheese. 2. Brush 4 Tbsp. of EVOO on baguette slices and toast in the oven until golden. Remove from oven and let cool. 3. 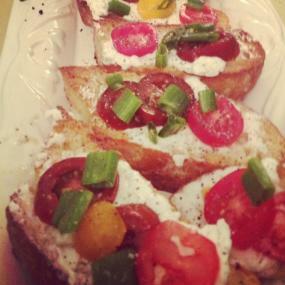 Spread whipped goat cheese on each toasted baguette slice and add tomato slices. Drizzle 2 Tbsp. of EVOO and balsamic vinegar. Finish with salt, pepper and green onions. 1. Heat oil in a medium saucepan over medium heat. Add shallot, season with salt and pepper, and cook, stirring occasionally, until soft, about 5 minutes. Add quinoa and cook, stirring frequently, until quinoa starts to toast and smell nutty, about 5 minutes. Add chicken broth and bring to a boil. 2. Stir in quinoa, reduce heat to low, cover, and simmer gently until quinoa is tender, 25-30 minutes (15 if using white quinoa). Remove pan from heat, fluff quinoa with a fork. Cover; let stand for 5 minutes. 3. 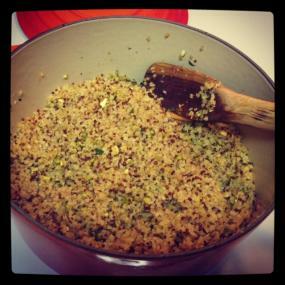 Fold pistachios, parsley, and mint into quinoa. Season with salt and pepper. 1. Place ramekins on a rimmed baking sheet. Heat cream, 2 Tbsp. honey, and sugar in a small saucepan over medium heat until just beginning to simmer. Scrape in seeds from vanilla bean; add bean. Add lemon peel; remove from heat. Let steep for 5 minutes (cream should register about 160° on an instant-read thermometer). Remove vanilla bean and peel. Gently stir in 5 Tbsp. lemon juice. 2. Divide custard among ramekins and chill to let set for at least 1 hour or, covered, up to 1 day. 3. Whisk remaining 2 Tbsp. honey and 1 Tbsp. lemon juice with rum in a small bowl. Stir in fruit; let sit until juicy, about 1 hour. Serve with custard.